VERSATILE – XERFLEX RESISTANCE BANDS ARE A GREAT WAY TO ACTIVATE CORE MUSCLES AND FIRE UP YOUR GLUTES, an Excellent way to Ensure your Muscles are Prepped for any Fitness Workout. – Best used for Yoga, Pilates, Strength, Mobility, Rehabilitation, and Activation, Strengthening Stabilising Muscles. NO PULLING OF THE HAIR AND SKIN – Xerflex Resistance Loop Bands are Designed and made from the Best Quality Natural Eco Friendly Latex, with a SMOOTH FINISH TO ENSURE THERE IS NO PULLING OF THE HAIR AND SKIN, Unlike other Poor Quality Bands on the Market. A GREAT ALTERNATIVE TO THE GYM – EASY AND EFFECTIVE WAY TO DO A WORKOUT, whether on Holidays, at Home, at an Exercise Class, or at the Gym. The Carry Bag Provided Makes it an Easy Option to take and Use Anywhere. 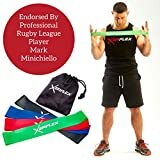 SUITABLE FOR MEN AND WOMEN OF ALL AGES – YOUR XERFLEX RESISTANCE BANDS ARE SUITABLE FOR ALL FITNESS LEVELS. The 30cm Long x 5cm Wide Exercise Loop Bands come in 4 Colours each Providing a Different Level Of Resistance. Target any Muscle Group in the Body and Tailor Your Workout using the Bands Individually or Together, Depending on The Level of Resistance Needed. MONEY BACK GUARANTEE – XERFLEX RESISTANCE BANDS COME WITH A 60 DAY MONEY BACK GUARANTEE. So for whatever Reason you’re Not Happy with your purchase, get in Contact with Us and Send your Product Back within the 60 Days and We will Refund your Money No Questions Asked. If you are Ready to Benefit from our Great Product, then Press Buy Now and Add to Basket. ULTRA SMOOTH FINISH which guarantees no pulling of the hair and skin. Your Xerflex Resistance Bands have been specifically designed with your comfort in mind. Only the Best Quality natural latex has been used to ensure our bands last year after year. Looking to improve Body Tone, Increase Strength, Fitness and Mobility? Need to Workout away from the Gym or when on Holidays? Recovering from a Sports Injury or Surgery? Then our Resistance Bands are Perfect for you. Xerflex Resistance Bands will help enhance your Yoga and Pilates Performance, Ideal for Core Muscle Activation and Strength, also Improves Mobility and Fitness. USE YOUR XERFLEX BANDS ANYWHERE. The Carry Bag provided makes it easy to take on Holidays and continue your Workouts. Workout in the Comfort of your own Home or take with you to a Yoga or Fitness Class. The Bands are so Versatile you can use them Virtually Anywhere. REHABILITATE YOURSELF FASTER WITH XERFLEX RESISTANCE BANDS. Strengthen Stabilising Muscles and Activating core Muscles are Essential to Rehabilitating any Injury or Surgery. With each Colour providing a different level of Resistance, you can Work you way through each Band until you are Fully Recovered. Xerflex Resistance Bands are suitable for Men and Women of all Ages and Fitness Levels. Use the Bands Individually or Together to Target any Muscle group within the Body. Our Bands come with a 60 Day Money back Guarantee SO FOR A RISK FREE PURCHASE PRESS BUY NOW OR ADD TO BASKET. This entry was posted in Fitness Products and tagged Activation, Bands, Core, Enhances, Exercise, Fitness, From, ideal, Improve, Injury, Latex, Loop, made, Mobility, Muscle, Natural, Perfect, Performance, Pilates, Premium, Quality, Rehabilitation, Resistance, Solution, Strength, XerFlex, Yoga by Summer 365. Bookmark the permalink.